Who's in your hearse backseat? Skeleton Backseat Driver Car Static Vinyl Cling. Fun for Halloween or anytime. Clings to glass and mirrors. Your backseat driver is bored to death... Watch passersby do a double take when they see who is sitting in your backseat! 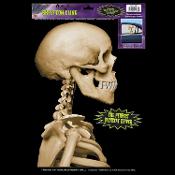 This hilariously funny and realistic skull static car window sticker image of a near life-size profile skeleton skull with upper torso, will give your backseat the appearance of having a ghostly occupant... This spooky conversation piece gets plenty of attention! Not just for cars... place in front windows, bathroom mirrors or shower doors, anywhere you want a creepy surprise for friends and family members! Each figure image measures approx. 15-inch high x 9-inch wide (37.5cm x 22.5cm).